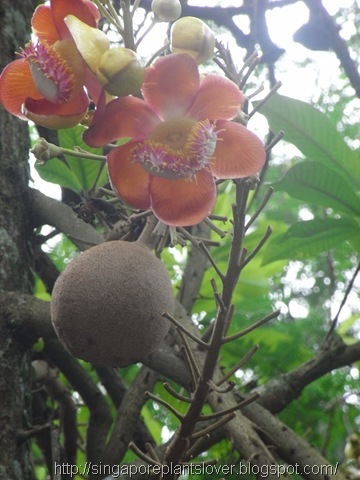 Couroupita guianensis (common name is Cannonball Tree), belongs to the family Lecythiaceae. There are quite a number of these trees in Singapore, one is at Ang Mo Kio gardeb west, one at botanic garden, one at Sembawang Park, one at east coast park…many more other places. The flowers are large, beautiful, pleasantly aromatic. Grow on stems that sprout out of the trunk of a HUGE tree. 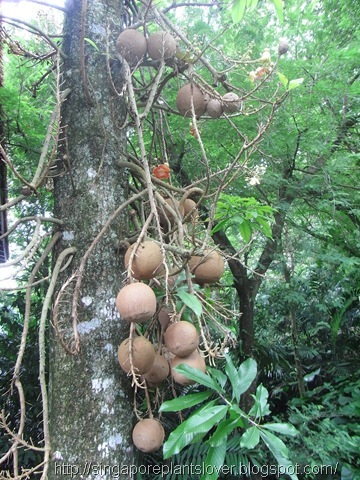 The fruit is are in the shape and size of cannon balls, that is why the name “Cannonball Tree” called. Both the flowers and fruits grow on stems that sprout out of the trunk of a HUGE tree. …Other two old pictures below taken in Singapore zoo last year, more fruits growing on the tree trunk. 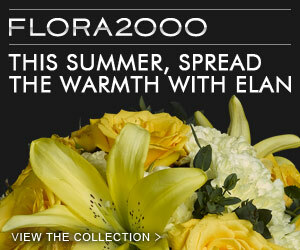 …Other beautiful flowers here: Todays Flowers. what an unusual tree! i haven't seen this before, and i'm not sure if e have it here. the flowers are very pretty and interesting. i love your photos! This is a fantastic tree. It looks so exotic with its beautiful flowers. I have seen my first one in the botanical garden in Cairns. I was so impressed. Great photos. These are very commonly found here in Singapore but I must admit there's a kind of odour to these flowers which turn me off! did you notice it? The yellow flower you see in my blog was taken just outside Ang Mo Kio hub, just opposite the MRT station. They are commonly grown here in parks and along the roads, but maybe because it's short blooming period, not many people recognize it. I try to get the seeds, have some one can help me? Hi,everybody. Could you someone give me some information to get the seeds? Could you someone give me some information to get cannonball tree seeds in singapore?